Well if you are praying for The Libertines of old, you are going to be disappointed. The lads have aged and the songs have matured as a result. There are far fewer of the indie-punk moments which were the trademark of Carl and Pete in 2003-4. In tempo the album generally more reminiscent of France the gorgeous hidden track on their eponymous second album. This is not a perfect album either. There are a couple of songs which miss the mark and a few very, very sketchy vocal performances at times. These weaknesses come near to the start of Anthems for Doomed Youth as Carl and Pete attempt to recapture that aural chemistry and rawness of old. Unfortunately the wispy shouting no longer reaches those heights. Fortunately those moments are quite rare as the band focuses on what truly set them apart from their contemporaries, the wonderful song writing of Pete Doherty and Carl Barat. Anthems For Doomed Youth is full of wonderful songs. But this is an end of the night sitting around with friends album rather than the tracks you would pick to get yourself ready for a night on the tiles. Opening with Barbarians is a bold move as it contains possibly the best Carl vocal on the album and possibly the best I have ever heard from him, but the backing and occasional vocals from Pete are without doubt the sketchiest to say the least. To my personal taste this gets the poorest track of the album done and dusted with. Lead single, Gunga Din, sounds definitively The Libertines with tightly strung guitar, uplifting chorus and lyrics which echo the life of an addict. It is a better song than I originally was going to give it credit for as what at first listen sounded bland and sensible is true song structure. It’s a good song. Fame and Fortune is a touch Libertines-by-numbers but with a dash of sixties psychedelia in the references to soldiers and Camden. Previously this could have been a highly appreciated, quirky B-side, but it is just a bit flat. 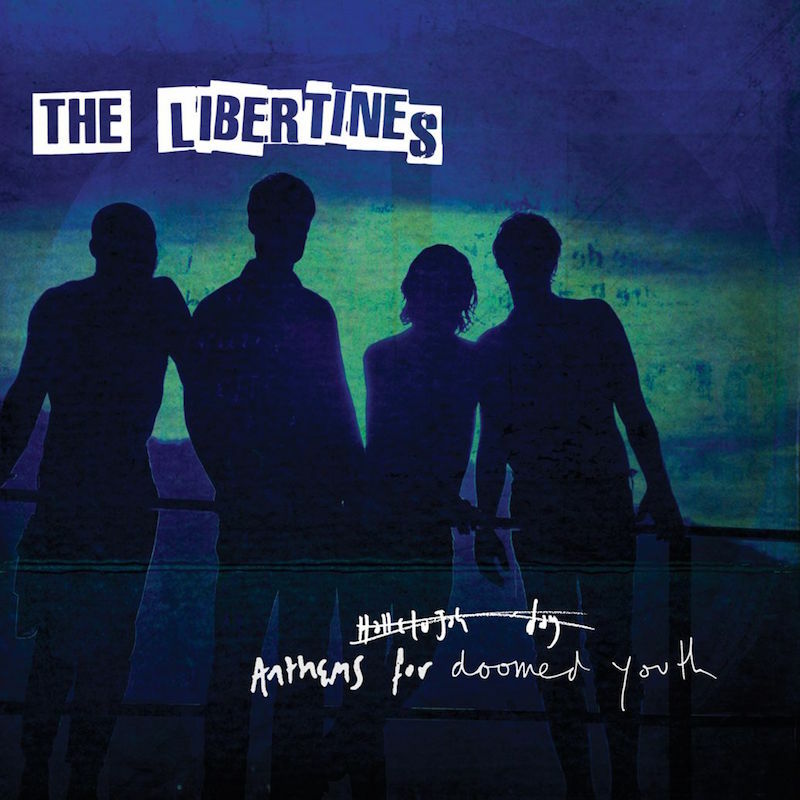 Anthem of Doomed Youth on the other hand is probably the most beautiful track The Libertines have ever recorded – despite the introduction being strongly inspired by Songs of Love by The Divine Comedy (the theme from Father Ted). Anthem of Doomed Youth is soaring and uplifting. If Blur released it as a one-off it would walk into the top five singles of the year without a shadow of doubt. You’re My Waterloo is I hope an indication of the future of the Pete Doherty songs within The Libertines. A vocal which is uneven, crackly and draws you in with every syllable surrounded by some Clapton-sequel guitar playing. It doesn’t get beyond walking pace, let alone near breakneck speed, and it is all the better for it. Belly of the Beast has a lot of humour with references to a Bangkok half hour and “black Jack, paddy whack” type rhymes and a jaunty rhythm throughout. If The Libertines ever played a half-empty gig this would be great to dance to with a cheeky smile, but if Pete and Carl are in the arena there is only ever squeezing room. Iceman seems to be a biographical tale of a man whose services are always on call… Filled with London references and unsuccessful but undeniably fitting harmonies, there is once again a nod to quirky, haunted psychedelia. The sound explodes through for a short spell in the last minute without changing the atmosphere and ethos of the track. It spins my head and makes me reconstruct my thoughts on what had gone before and give a knowing nod towards the record player. Boys, you’ve grown up. Heart of the Matter comes straight from Up The Bracket and to be honest I can take it or leave, but it is an enjoyable rattle through three minutes. It is kind of forgettable to be honest. Fury of Chonburi continues the old school Libs feeling with energetic guitar playing and obscure reference and alternating vocals. It feels almost included on the album to keep original fans happy. However for the increase in tempo, it is missing the spark and spite that The Libertines were synonymous with in their first life. A lament towards simpler times comes in the form of The Milkman’s Horse. “What have you done, get out of my dreams you scum” is a disappointing, phoned in lyric though, ruining an intelligent piece of songwriting. Then we have the best title on the album Glasgow Coma Scale Blues which turns into an awkward, singalong which lifts the corners of your mouth up. For a band who generally seem to lurch from serious crisis to songs about serious crisis this is a wonderful release. It is warm, pleasurable and they know it. Anthems for Doomed Youth finishes with the Hammer Horror does indie of Dead For Love. This takes me into the dark moments of the history of the band but has such sunshine and hope too. More than any other song on this record it is the one where you imagine old friends getting together and saying to each other “we will do this”. The Libs have grown up with this album. I hope their audience has grown up too and can appreciate exactly how good this piece of music is – flaws and all. I know everybody wants to hear the old hits, but I really want to see this album played live in full. It isn’t the album I wanted when I pressed play, but I am so happy with the one I got.